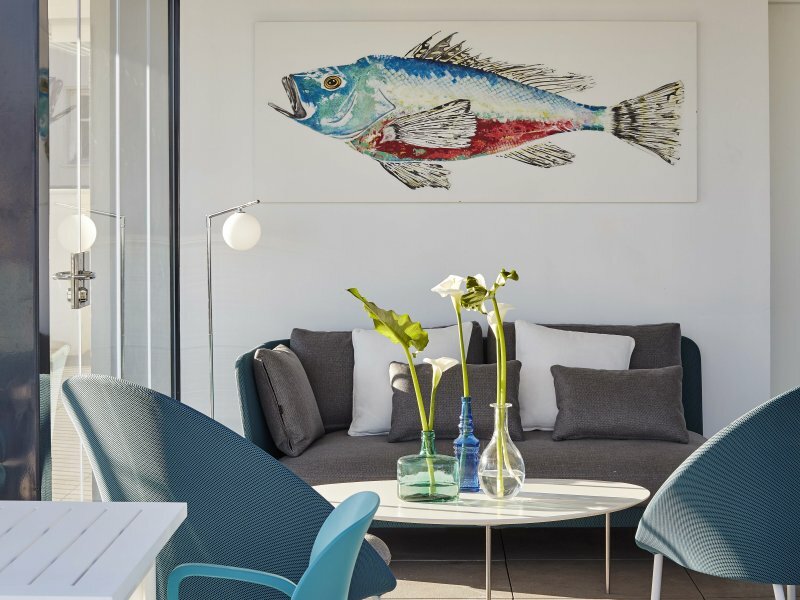 We previously worked for Room Mate Hotels on another project in Salamanca. The client wanted a Mediterranean, warm, elegant, comfortable, fun, and chic hotel. Durable materials. 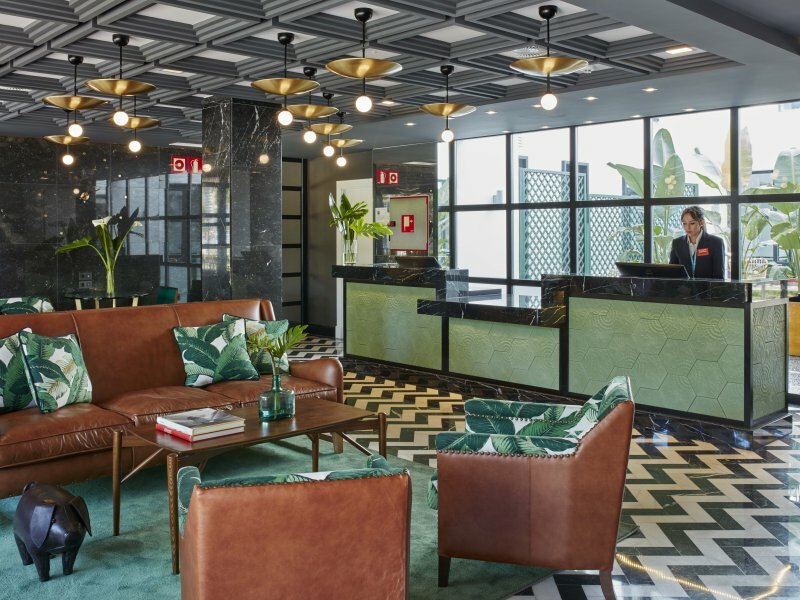 They had quite a few specifications in regards to quality, based on their experience with other hotels in their chain, including two other hotels in Malaga, but were quite open to design suggestions. The fact that the facades of the two buildings were to be kept standing impacted the final look. They are a classic design and we wanted a hotel that would not be too much of a contrast with the outside. When working on a Hotel project, one has to remember not only the Hotel's requirements, but also how you feel as a client of a Hotel, what makes you feel comfortable and luxurious but also what surprises you. There are also safety and durability issues that have to be taken into consideration. We learnt to work with these requirements. Two side by side, five storey buildings. A pool, terrace and bar in the terrace overlooking the Port of Malaga. Three floors with rooms and corner suites up to a total of 61 rooms. Ground floor has the lobby, two courtyards and an upcoming restaurant. The basement has breakfast room, courtyard, gym, two meeting rooms and kitchen. A restoration is always more challenging than building from new. You run into all sorts of technical issues that appear as the work progresses, so you have to be ready for Plan B. The fact that the two buildings were not exactly the same height made building almost like assembling a puzzle, although the result is more interesting. The challenges are usually the same: trying to please the client, the architect, the local authorities and yourself! 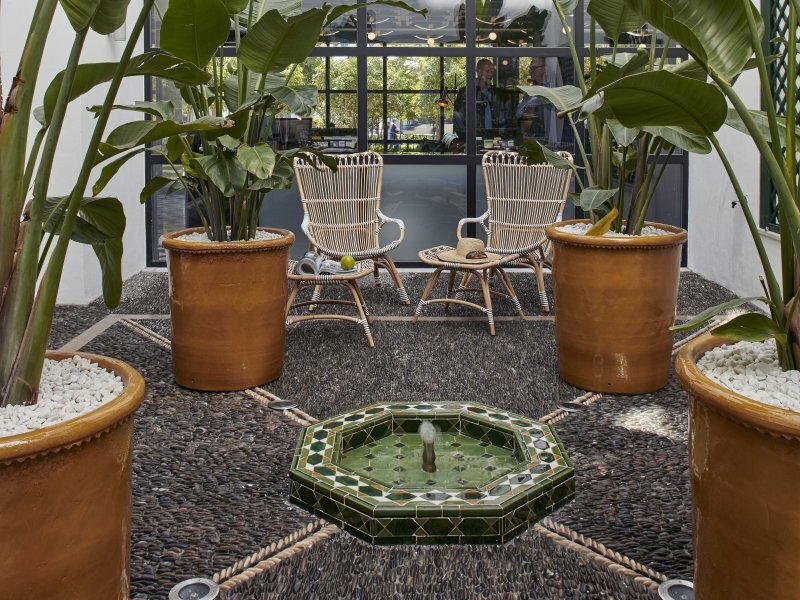 Our revised traditional Andalusian courtyards with black pebbled floors (installed by artisans from Cordoba) with giant yellow glazed pots, and the vinyl wallpaper we designed for the corridors inspired by leaves from the Botanical gardens of Malaga (Monstera and Strelitzia). We brought a bit of the outdoors inside. We are trying to REVISE and use traditional Spanish materials such as leather, wrought iron, hand painted tiles, glazed pots, the pebble floors in patios in a more modern way but with the same quality. Because of the importance of the parks and gardens in Malaga, we wanted to reference them in our design and bring them also indoors. Finally, the view on to the Mediterranean called for fresh and bold stripes in the colours of the sea. 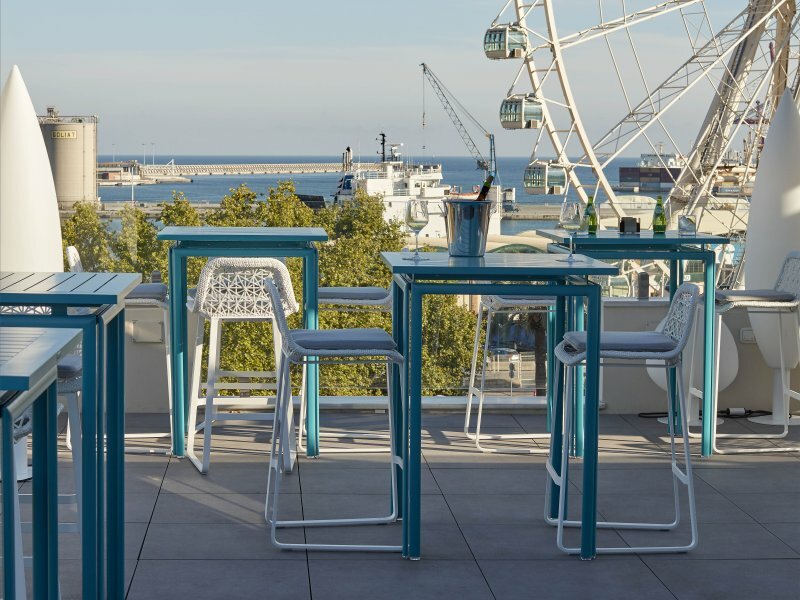 Terrace: From the terrace of the hotel, views of the Port of Málaga and the Ferris wheel. Turquoise metal tables by Fermob with Maia stools by Kettal. Lobby: Black and white zig-zag marble floor. Leather sofas from Tapizados Chissell with Hawaiian Holiday cushions by Guell Lamadrid. Wooden coffee table by Dan Form. Green rug by KP Deco. Counter, a Melian design, customised in marble and green Gaudí tile from Larinto. Areti ceiling lamps from Contract Deco. 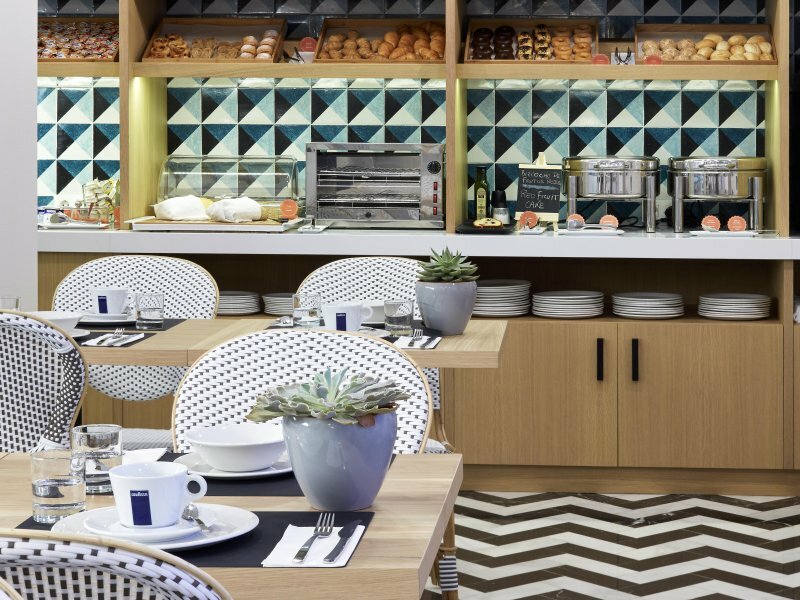 Breakfast Room: Wooden breakfast buffet, a Melián design. Black and white zig-zag marble floor. The hand-painted tiles on the wall behind the buffet are by Sant Anna of Lisbon. Mullan glass lamps from Contract Deco. Rattan chairs by Sika Design and iron and wood tables by Francisco Segarra. 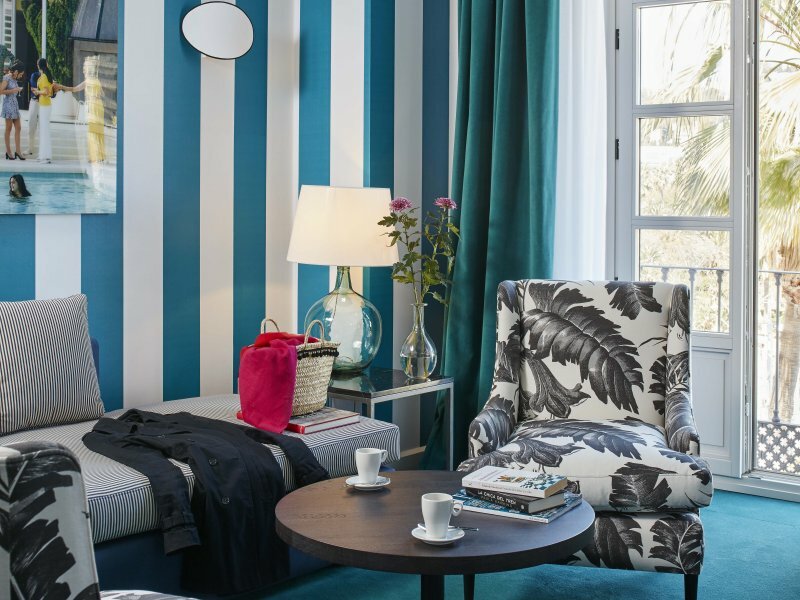 Suites: Turquoise and white striped wallpaper by C de C. Sofa designed by Tapizados Chissell with fabric by Jover. Coffee table in black wood by Expormin, and side tables with black marble tops by Guadarte, with lamp by Dama Juana The Flea. Chairs by Chissell Tapizados with fabric from Gastón y Daniela. Plain carpet by Interface and velvet curtains by Jover. Granada-style hanging lantern by Hijos de Estevez and wall lights by Lezcano Iluminación. Photograph of Slim Aarons from Yellow Korner. Bathroom: White and black porcelain checkerboard floor by Ondacer. 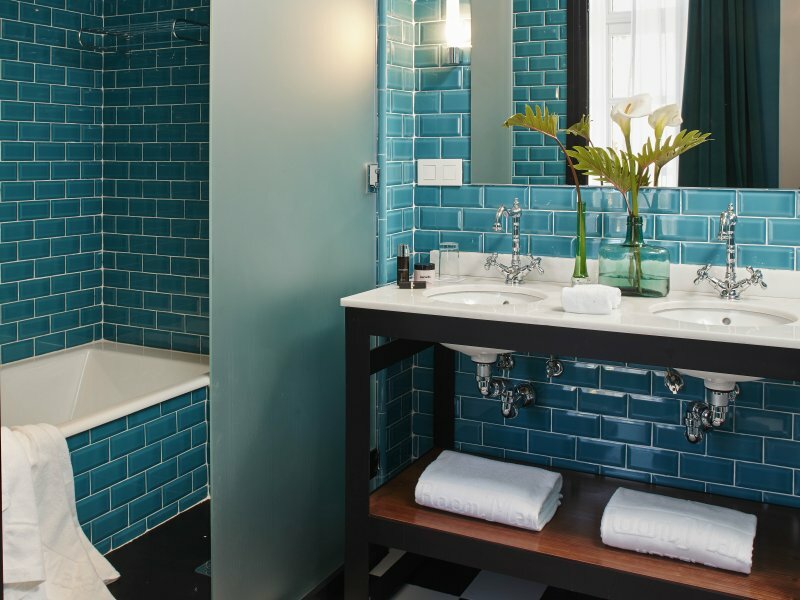 Rectangular turquoise tiles by Ondacer. Black steel cabinet, a Melian design, with sinks and faucets by Roca. Wall lights by Años Luz. Courtyard: Courtyard paving made of black "enchinado cordobés". Fountain made of glazed ceramic from Alizares. Glazed honey-coloured plant pots by Jesús Gomez and banana trees from Viveros Guzmán. Rattan chair and footrest by Sika Design. 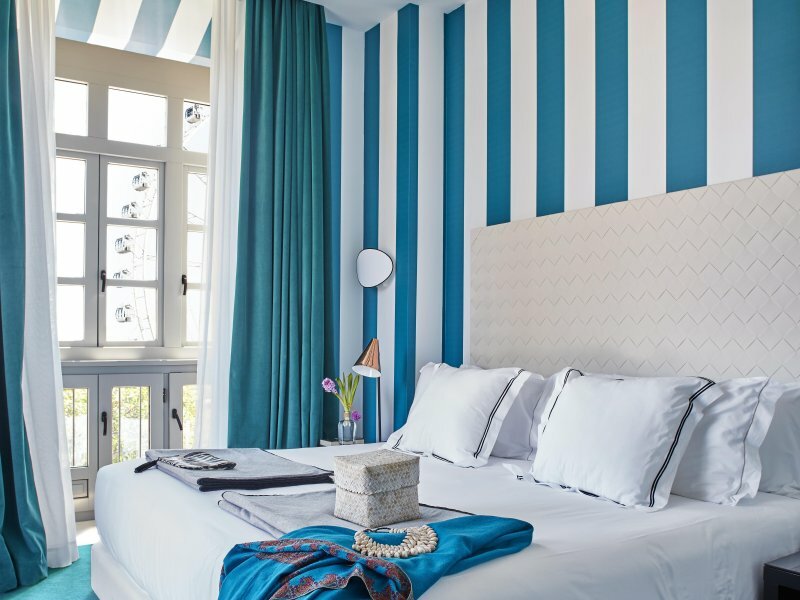 Rooms: Turquoise and white striped wallpaper by C de C. Plain carpet by Interface and velvet curtains by Jover. Granada-style hanging lantern by Hijos de Estevez and wall lights by Lezcano Iluminación. Copper table lamp by Vitor Pintado. Felt blanket by FranciscoCumellas. 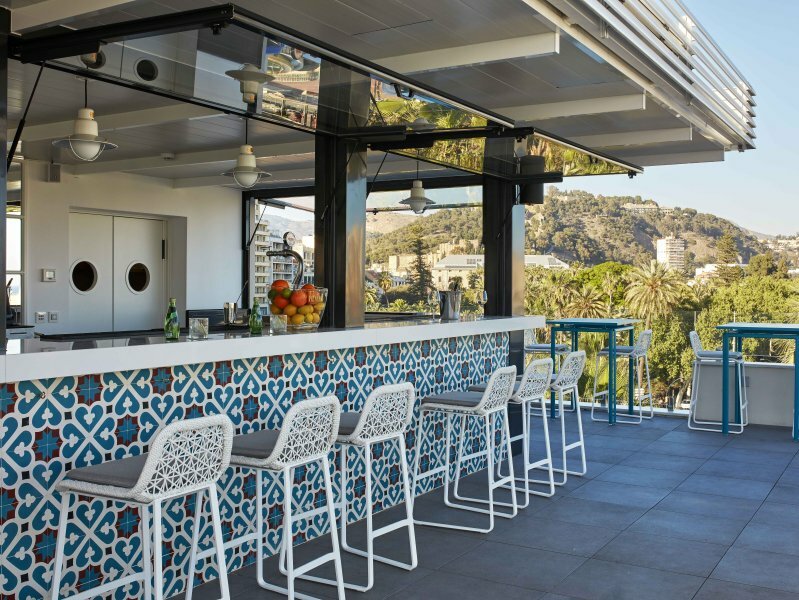 Bar: Bar, a Melian design, with a white Silestone countertop and front covered with Andalusian-style glazed ceramic tiles. Hanging lamps by Luz Deco, stools by Kettal and metal tables by Fermob in the background. Terrace: A quiet corner under the overhang on the terrace. Kabu model sofa and chairs from Expormin. White cotton pillows. Endo standing lamp by Años Luz. Fish painting by the artist Monique Sablán. White metal table by Fermob with Amy turquoise chair by Retiro Mobiliario. White coffee table by Stua. 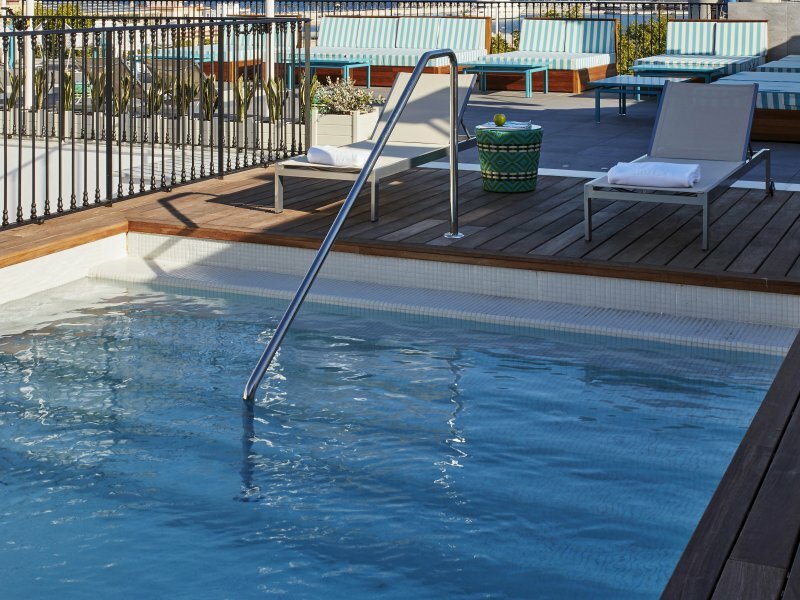 Swimming pool: Poolside area paved in wood by Teka. Loungers by Kettal with woven pouf by Point. In the background, umbrellas by Solero. Wooden beds by Teka with mattresses in striped fabric by Francisco Jover.